Being a free agent means having the freedom to pick whatever job he or she wants if so many suitors seek his or her service. That’s the perks of being great at what he or she does. Pro athletes have that luxury if they are great at what they do. It’s their power. It’s their right for doing great service for a long time. They deserve to get paid and get the job they want. Kevin Durant exercised his freedom as a free agent on the Fourth of July. He decided to take his talent to the Golden State Warriors on Monday afternoon after playing nine seasons for the Oklahoma City Thunder. There’s no issue about him leaving the Thunder. Nine seasons is a long time for him. It’s understandable if he needed change for his growth. But how does playing for the Warriors make it any better for him? Even if he wins a championship with them, he will be known as a player who took an easy way out by riding on the coattails of Steph Curry, Klay Thompson and Draymond Green. Ask LeBron James. Everyone thought his two championships with the Heat was meaningless since he won on Dwayne Wade’s coattails. No one took him seriously since he took the easy way out by building a super team in Miami. For James to win back credibility and favor from the public, he had to go back home and lead the Cavaliers to a championship for the sake of his legacy. He did just that in this year’s NBA Finals, and he is now America’s most beloved athlete. This is what happens when a star engineers a 3-1 comeback deficit to win a championship for a city that has been championship-starved for 42 years. Durant now becomes America’s villain. This is what happens when he is joining a championship-laden team. There are going to be expectations for him. He has to win it all or he will be ridiculed for not getting it done. Even if he gets it done, he is not going to get credit he deserves. Critics and pundits will poo-poo his accomplishment by saying he took an easy way out. Charles Barkley and Reggie Miller said it publicly. This is why it’s odd Durant would join the Warriors. If he wanted to really make a difference to a new team, he would have signed with the Celtics. That was the way to go. He could have transformed that franchise to a championship level. If the new Warrior signed with the Celtics, he would have been beloved everywhere. He would be praised for taking on a challenge. He would have gotten out of his comfort zone where he would deal with added responsibility of leading a historic franchise to a championship. He would have been an icon in one of the toughest sports cities to play in Boston. Now, Durant has to deal with scrutiny for the first time in his successful NBA career. That means there is expectations. It’s about winning a championship and nothing else. To Durant’s credit, he is embracing it. He knew what he was doing signing with the Warriors. He wants to get a championship ring to fill out his Hall of Fame resume. He is ready to deal with the consequences if he does not get it done. Durant has been desperate to get a championship for a long time. He is going to be 28 when the season starts. This is the prime years of his career. This is where he has to get his championship. It’s going to be his tenth year in the league coming up. He knows he can’t keep wasting opportunities. This is why he had no problem being on a team with players that already won a championship in Curry, Thompson and Green. In his opinion, it’s an effective way to get a championship. It worked for James in Miami, so he has no regrets about his decision no matter what happens in his tenure with the Warriors. Still, it has to feel cheap that Durant is taking the easy way out rather than finishing the job with the Thunder or lead a new team out of nowhere to win a championship. It’s hard to envision Patrick Ewing, Magic Johnson, Isiah Thomas, Larry Bird, Reggie Miller, Barkley and any other great contemporary player would do what Durant and James done. It’s a sign of the times. The modern day athlete has a different mentality. This goes back to their AAU days. Kids from different cities play together, and then they dream of playing together again in the pros one day. They want the camaraderie and the thrill of winning, which is why they play together. It is what it is, but I don’t have to accept it, either. Give Durant points for having the conviction to play for the Warriors. Still, it does not feel right what he did. 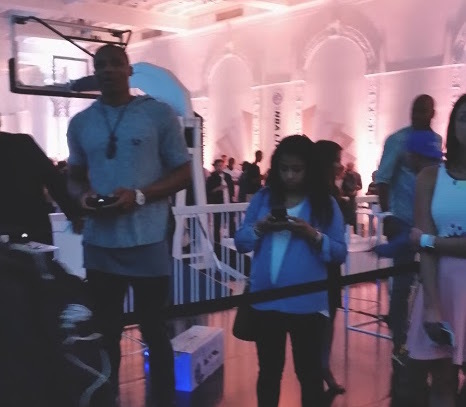 Former teammate, Russell Westbrook pictured above.